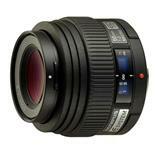 The high-quality ZUIKO DIGITAL 50mm 1:2.0 Macro lens offers an equivalent range of 100mm on a 35mm film camera. This is a special macro photography lens designed for use with the Macro flash system but also equally good in normal use. Its 2.0 maximum aperture gives it great light-gathering power. The lens includes an ED element for sharp, brilliant colour images. It offers a magnification of 1:2 (half life size), which has an image magnification size equivalent to life size (1:1) in a 35mm film photo.